It is rare for me to go to theatre anymore and be reminded of and immersed in the ritualism and community at the historical core of the art form. Despite the fact that I see many many theatrical events (I’m a playwriting grad student; it’s in the job description), I find that beyond the simple nature of sitting in a room and breathing the same air with strangers, I don’t often have a palpable connection to the community of performers or the people around me. 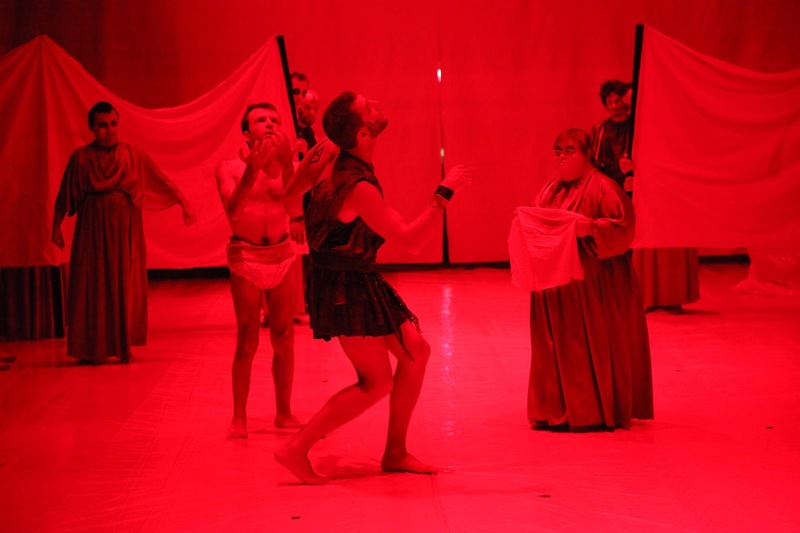 That, however, was not the case at Teatro Patilogico di Roma’s Medea at La MaMa E.T.C. (which closed on October 18th). Medea, adapted and directed by renowned international theatre artist Dario D’Ambrosi, features a principle cast of professional actors from Italy and New York, and a fourteen person chorus made of up diversely-abled actors from La magia del teatro, a drama academy for those with schizophrenia, Down Syndrome, autism, and other diagnosed disorders. The adaptation is partly performed in Attic Greek and partly performed in English. After a quiet first moment, in which a chorus member comes to the center of the stage, opens his arms to the heavens and is splattered with blood from above, the stage fills with the chorus members, who erupt with chants and rhythmic sounds, all underscored with live music. The Attic Greek chants were surprisingly inviting, doing their part as a call to the heavens and allowing the audience into the rituals of this world — a world in which the repetitive gestures of human bodies on stage are the principle vocabulary of Medea’s plight. In the opening scenes of the piece, and continuing throughout, I was impressed by the choreography of the chorus and the particular attention that was paid to the key theatrical element of time. Each action, movement, and moment was given exactly as long as it needed to serve its dual function as tool and story. The audience sat in silence, watching the development of characters, chorus and principals alike, as they walked down the long thrust of the Ellen Stewart Theater, performed the language of their bodies, and walked back. I was captivated by these moments, feeling the electric connection between the performers and spectators. Mr. D’Ambrosi’s actual adaptation of Medea was clear enough, although it was entirely secondary to the physical language of the piece. The primary performers were generally compelling. Celeste Moratti (Medea) and Mauro F. Cardinali (Jason) were imbued with the definition of emotional passion. In the wedding scene, Duane Allen’s joy (as Creon) was contagious. Particularly compelling was Michela D’Ambrosi as a ghostly Glauke who wandered the perimeter of the stage repeatedly singing the same haunting notes. Because of the attention to stillness in other parts of the production, the constant movement in the scenes with Medea and Jason made it hard to follow their banter and longer speeches. There were times, because of the generous sprinkling of blood on the plastic floor and some erratic movements, especially by Mr. Cardinali in the dream sequence, that I feared for the safety of the performers. Visual pictures throughout were stunning, the lighting often switching between cool blues and the bright red of the depth of Medea’s heartache and revengeful spirit. The use of distancing via the long stage was utilized to emphasize the moral space between the characters which, in turn, allowed the audience to follow their emotional journeys as they moved closer together or farther apart. In the final breathtaking moment of the play, Medea descends the staircase at the end of the theatre, stands on a platform, and is lifted and carried off stage over the distraught Jason who is collapsed in the middle of the floor. To my knowledge, programs like La magia del teatro are few and far between, which made the excitement of watching a host of diversely-abled performers express themselves on stage tangible in the seats. The audience and performers morphed into one community, supporting the movement of the story. At times it felt as though the overarching themes of Medea (revenge, betrayal, power) were the most clear in moments where the ritual was highlighted and the dialogue was absent. It was a reminder that clear visuals and kinetic movement often do the work when our words fail.